Its been reported that the project of Worlds largest Underwater Hotel in Dubai is set to begin soon. However, authorities didn’t give any timescale for the completion of project. The Hotel has been designed by a Polish company Deep Ocean Technology with the help of Swiss firm BIG InvestConsult AG. Bogdan Gutkowski, the chief executive of Big Invest, confirmed that the plan to build one of the hotels off the coast of Dubai was going ahead. Swiss company signed an agreement last year with Dubai’s Drydocks World to act as contractor. Water Discus Hotels Dubai comprise of two discs, above water and an underwater. Both discs will be connected by 5 solid legs and a vertical shaft which contains a lift and stairs. According to designers this combination will allow guests to admire the depth of the ocean while making the most of the warm climate. Underwater section of the Hotel will be upto 10meters under the sea surface and will comprise of 21 double room with a bar and a diving center, where diving training courses will be given even for the beginners. 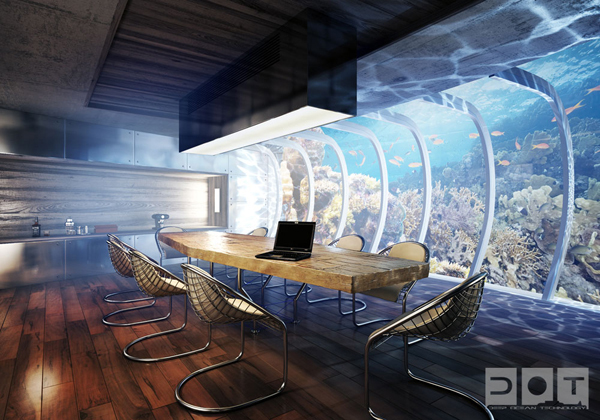 Each room has been designed the way that guest can experience the underwater world as closely as possible. Very interesting aspect of the design is that Water Discus Hotel can be transferred to a different place in case of environmental or economic concerns. The discs have been designed to be buoyant same like submarines and floating Balloons. Also the discs can be detached from the main structure to act as lifeboats.